One of our most diverse and popular options which allows continuous path contouring using X, Z, & C axes. 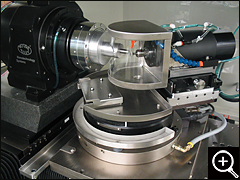 This option is used for single point diamond machining of toric & freeform surfaces via Nanotech's "Slow-Slide-Servo" (S3) machining process. 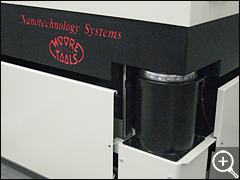 Note: S3 machining requires Nanotech's NanoCAM43T or suitable software for generation of X, Z, C file formats. Fully constrained oil hydrostatic rotary bearing option. For use with the Nanotech 450UPL or 650FG machines, this axis utilizes a direct drive brushless DC rotary motor and high resolution encoder. 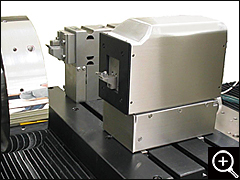 The B-axis has a positioning accuracy of +/- 1.0 arc second and feedback resolution of 0.005 arc seconds. Radial and axial motion errors are guaranteed to ≤ 100nm. Includes pneumatic / mechanical brake. This optional upgrade to Nanotech’s standard air isolation system provides enhanced vibration isolation and damping in both the horizontal and vertical planes with a natural frequency of ≤ 2Hz. 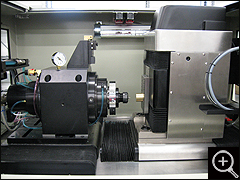 Suitable for larger part grinding as this spindle has the stiffness to support larger size wheels. Most popular Air Bearing Auxiliary Spindle. Ideal for high speed and extreme accuracy applications such as raster flycutting, micro-milling and micro-grinding of optical molds. 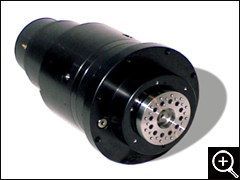 A combination of spindle central stiffness, extremely low error motion and powerful brushless DC motor performance. With radial and axial runout of < 25 nm, this spindle is ideal for small ball nose diamond milling tools which require such speed & accuracy for sustainable tool life. In addition, its compact size allows mounting in various configurations on our Oil Hydrostatic Rotary B-Axis.